As I prepare for my presentation I anticipated that those who are newly bereaved many fear that I am not "over it" after three decades. I wanted them to know that you don't really ever get "over it" as who would want to "get over" the death of a loved one? Last Sunday night I attended Midpennsula Chapter of The Compassionate Friends worldwide candle lighting in Brisbane, California. At 7 p.m. we lit candles in memory of our loved ones who have died. A wave of light going around the world remembering beloved children/siblings and grandchildren. 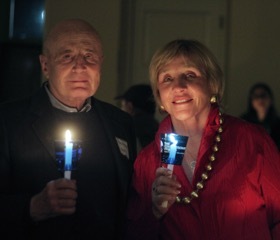 Prior to the lighting of the candles I gave a presentation on factors that impact holiday grief. It has been over 30 years since my son Scott was killed in an automobile accident. As I prepare for my presentation I anticipated that those who are newly bereaved many fear that I am not "over it" after three decades. I wanted them to know that you don't really ever get "over it" as who would want to "get over" the death of a loved one? You do the work of grief and with a desire to embrace life you eventually gain mastery over the experience. You come to deal with anniversaries, holidays and other events with the knowledge, "that was then and this is now". You don't get over trauma you learn to master it and then with time use it as a gift to help others in pain. Attending the event were around 60 people including extended families and friends of the deceased. Among those attending were my husband Phil and my grandson, Scotty, named after his uncle Scott. Scotty is a student at the Cronkite School of Journalism at Arizona State University in Phoenix. His field of interest is phytography and he is on the athletic field for many of the ASU football and basketball games. Home for Christmas break, to my surprise, he asked if he could go along and take pictures of the Candle Lighting in honor of his uncle. Below are three tips regarding Holiday grief and some of the special pictures that Scotty took. 1. Remember Grief is Physical and Emotional - When responding to the news of a death stress hormones are released which put our body in a state of heightened awareness. Reminders and memories of the deceased can trigger these stressed neurological pathways for years. Activities such as yoga, Ti Chi, and meditation have been shown through research to calm the mind. Walking, laughing, hugging and expressing gratitude can also calm the mind and release hormones that relax the body. These activities have been shown to be as effective if not more than anti depressants. Second Year/Thawing Out - This year I felt worse than the first. I was thawing out. That second year was a paradox as I was again beginning to heal the full impact of my loss. I was feeling sorry not so much for Scott but for myself as I had lost my only son. At times I felt like I was going crazy. Third Year/Thaw Completed - This is the year I was fully thawed out. This was the year I realized that this would be my life and I could make of my holidays whatever I wanted. It was up to me. This was the year I dropped out and spent the Christmas in Hawaii with my family. As my husband told a friend only a few days ago, "I always loved Christmas and I had lost so much I decided that third year that I would not let death take my enjoyment of the holidays." 3. Don't Forget to give yourself Credit - You are doing the best you can with what you have. Give others the gift of helping you this year and in the years to come you can give back to them. Below are pictures of me with my Santa Hat and a picture of my husband Phil and I lighting our candles. 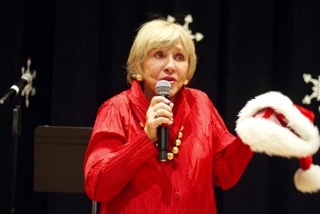 I have also included our Holiday Television show with my co-host Alan Pedersen, executive director of The Compassionate Friends. On the show we give additional tips and advice on getting through the holidays. The show was filmed on Public Access television with Alan singing his original music. Open to Hope Foundation© reserves all rights to content.